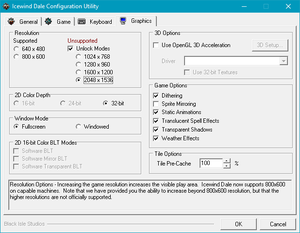 Frame rate is capped at 30 FPS by default; increasing affects game speed. Uses simple CD-check and LaserLock DRM for copy protection. Released on both 2-3 CDs or one DVD. 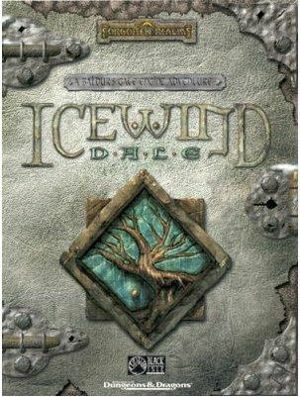 Bundled with Icewind Dale: Enhanced Edition. Includes compatibility fixes and the Heart of Winter and Trials of The Luremaster expansions. Requires the Heart of Winter expansion. There is one more video (game intro), if anyone finds out which file to rename please complete this list. 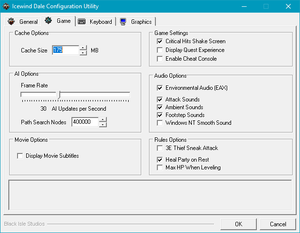 Note that trying to play these disabled movies from the movie selection will crash the game. Wine users can use Wine's winecfg program to set up a folder as a CD drive. Using cracks is not recommended since they can break compatibility with mods. 30 FPS default cap. Frame rate is tied directly to the game's clock and changing it will change the game speed. 1) Official localization by «Akella» – local retail and GOG version. The game will have problems with running with Avast! Antivirus Realtime Shield. The issue manifests in the game crashing when you try to edit your character bio or you try to import a character into a game. Install outside Program Files to avoid issues with file redirection. Will crash when you try to start a new game on newer operating systems, this can be fixed if you run the program as administrator. The game will have issues with displaying if you try to join a multiplayer game while in fullscreen mode. To get around this use Alt+↵ Enter to switch to windowed mode and back once you've successfully joined a multiplayer game. On older systems like Windows XP it is important to check your network interface priority if you keep having connectivity issues when you have more than one network. Ensure all players are running the same version of the game (the GOG.com version is v1.41). 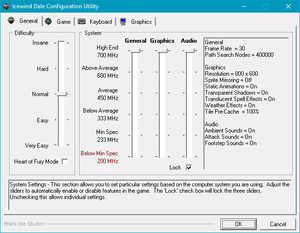 The game version can be found by starting a single player game and opening the main menu; the game version is then displayed in the bottom left of the screen. Check that the game's 'Cache Size' is at least 140mb. 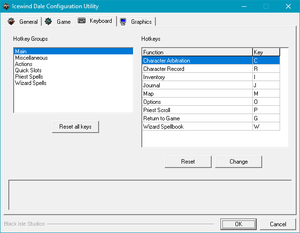 This can be checked and changed with the 'Config' program, which is located in the folder where the game is installed to. Check that both players share the same 'Game Speed' value. This can be checked and changed with the 'Config' program, which is located in the folder where the game is installed to. The GOG.com version does not start correctly on Windows 10. Delete or rename ddraw.dll. The game should now start correctly. This page was last edited on 17 April 2019, at 23:02.